I went out to Jubilee Furniture Co. this weekend to pick up a black swivel chair that I saw on BarryBlog. His photos are far better than mine, but I did snap a few shots of things that caught my eye. There were so many pieces that just needed a quick sprucing up with a coat of paint or some new fabric, and the prices are really reasonable. The chair was intended for Brandon’s office but now that I have it here, it seems a little too short. It’s comfortable though, and it doesn’t make the loud CREAK that his current chair does whenever anyone sits down in it. Great finds! 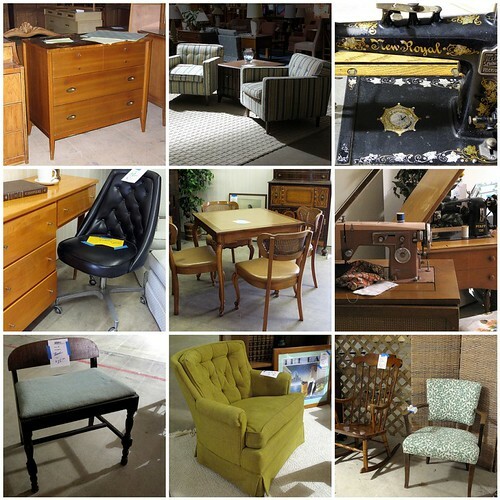 These places are heaven for furniture refinishers like me. Looks like they have some nice inventory. Wow! I’ll definitely need to take a trip to see this place. Thanks for the tip! I really wish that we had shops like this in our area. I love the things you found, they all have personality! What great stuff! 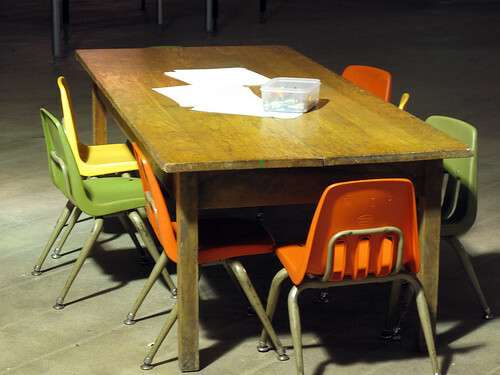 The kids conference table reminds me of something I picked up at my old church. It was a table that was used to put sand in for the kids to play in. I turned it into a coffee table and store things inside the table. Totally in love with those chairs, you are right, they just need a little upgrading and they are PERFECT! Such amazing pieces! That sewing machine in the top right reminds me of my grandma’s! Susan - Jubilee Furniture Co.
Hi Nicole! Sorry I missed you when you were out at Jubilee Furniture, but glad the chair worked out for you! The kids’ table is indeed not for sale, nor the chairs around it. The table was donated about two years ago and I tried to sell it for a long time without any takers so when the chairs were donated – and a perfect fit with the table – I decided to create the coloring table. It’s right in the middle of the store – so parents can keep an eye of their little ones while shopping – yet something fun for kids to do while mom/dad/grandma/auntie/etc. shop. We used to post the artwork on the front windows, but it kept blowing off whenever someone opened the door, so have a notebook where we keep it now. Sure appreciate your help in spreading the word about Jubilee Furniture. As a non-profit on a limited budget a positive endorsement like this is huge. Thank you. I love that you have that table and chairs out. It speaks volumes about what nice people you are there, to have a little kids’ area all set up! Ah yes, my home away from home. Sorry for stalking you there. . . I felt like I had to say hello. I was interested in most of the pieces you displayed, but I have to show constraint whenever I’m there or else I’d fill up my car every week. As it stands, most of my home is Jubilee. -Susan can attest to it! I love when people recognize me and say hello! It was really nice to meet you. Hi Nicole, I just came to your blog for the first time today from Danielle and Clint (Newlyweds Paradise. Both of your blogs are great and I really enjoy them. 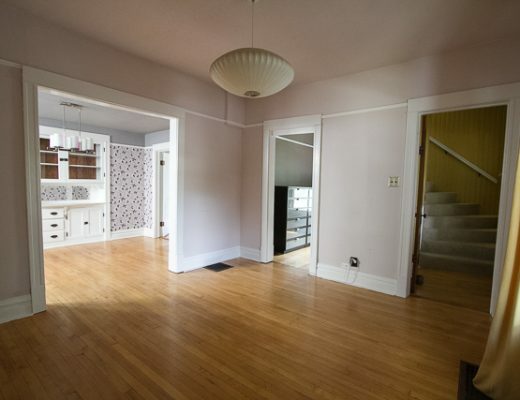 I was born and raised in Southfield-Oak Park (by 10 and greenfield) until a few years ago I moved away to Wyoming so I can totally envision your cute bungalow! The black swivel chair looks so comfy! wow! That place looks like a dream. And i adore that children’s table and chairs. we were out at jubilee last weekend and looking for a desk chair. i saw that black chair and made a beeline for it. then i saw the sold tag and the name on it! nicole balch!?!?!?! I love the chairs! So much potential. Also, you’ve been tagged with an honest scrapper award! Nicole I saw this today and thought of you since I know you love Jonathan Adler! Thanks for the link Nicole, and for the Jubilee coverage. Thanks too for the nice comments on my photos. I love taking photos. Oh wow, I actually have that dinette set (with the caning and cabriole). Same leather seats and inset. My next project is recovering the chairs and replacing the damaged leather tabletop with some of Maya Romanov’s metallic grasscloth. What a great store, with a great cause! It’ll be on my list to check out when I make it up that way! Thanks! i just love the 2 chairs at the bottom – left, and right. I own a sewing machine of the same model the one shown in your photo, and it is fabulous. An old workhorse, and so much you can do with it! I wish I lived wherever you do, because that store has dynamite merchandise.